American Snout (Libytheana carinenta [Cramer]) United States populations of this species were formerly referred to as Libytheana bachmanii. Wing span: 1 3/8 - 2 inches (3.5 - 5 cm). Identification: Labial palps long and extended forward. Tip of forewing squared off. 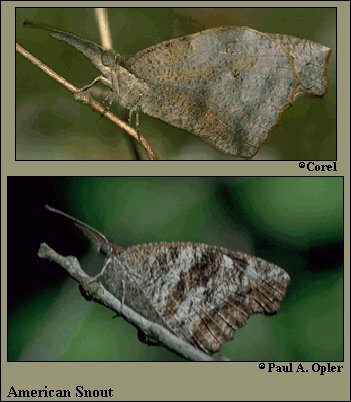 Upperside brown, forewing with orange at base and inner margin, and white spots on outer half. Underside of hindwing mottled or smooth violet-gray. Life history: Adults perch on branches and imitate dead leaves by holding palps and antennae downward to look like petioles. Males patrol near host plants to seek females. Eggs are laid in small groups on leaves of the host tree; caterpillars eat young leaves. Adults overwinter in the southern part of their range. Flight: Two broods; May-June, and August. These butterflies sometimes undertake huge migrations. Caterpillar hosts: Several species of hackberry (Celtis). Adult food: Nectar from flowers of aster, dogbane, dogwood, goldenrod, sweet pepperbush, and others. Habitat: Forest clearings and edges, thorn scrub, brushy fields, roadsides. Range: Argentina north through Mexico and the West Indies to southern United States. Migrates to central California, southern Nevada, Colorado, and most of the eastern United States. Conservation: Not usually of concern.